When I was younger, the power and allure of the Chinese grocery store was so strong that I thought that the forty-five minute drive from our house to the store or to Chinatown was all it took to go to China—as in…the country. I would literally ask my parents if we were planning on “going to China” that day (My sense of perspective didn’t really kick in until later in life). 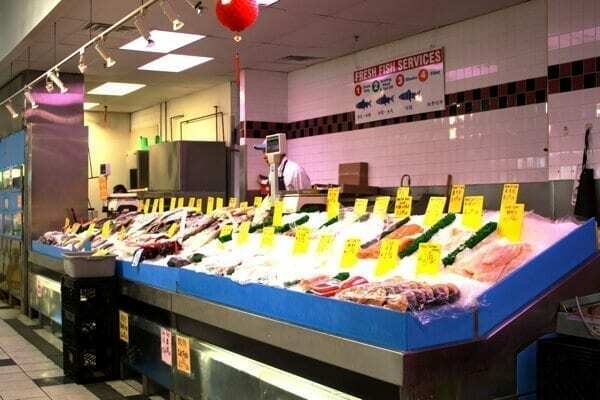 I was always engulfed by the sweet heady smells of the bakery case, the allure of the fresh produce, the liveliness of the fish and meat counters, and the quiet peacefulness of the dry noodles, seaweeds, and mushrooms, spices, and sauces. Then there was the hot food bar, with the rows and rows of vegetables, tofu, braised meat, buns, dumplings, fish, and stacked Styrofoam containers of complementary soup ready to go next to the cash register. And of course, the piece de resistance: the roasted meat case with glistening portions of roast pork, roast duck, poached chicken, and stewed octopus enticing everyone who passed. All Chinese grocery stores are usually organized in the same format. There’s the produce section where you can find all of your leafy greens, ginger, scallions, peppers, and mushrooms. The meat section with slabs of pork belly, ground pork, chicken, and dried sausage. Often, you’ll see a case of meat to choose from and tell the butcher what you want, how you want it cut, and how much you’d like. There’s seafood section with fresh fish in tanks, crabs in baskets, and maybe even a plastic barrel of live frogs (the frog thing is usually just available in Chinatown. Which is just as well. We’re not big on frog.) All of the seafood should be cleaned for you (with the exception of crab and lobster, which are usually sold live to maintain freshness). Then, there is the frozen section that has pre-prepared seafood, frozen vegetables (soy beans, bamboo shoots, and Shepherd’s purse veggies for dumplings, etc. ), ice cream and popsicles in Chinese flavors like red bean, green tea, green mung bean, and mango, buns, frozen dumplings, and scallion pancakes, among other things. 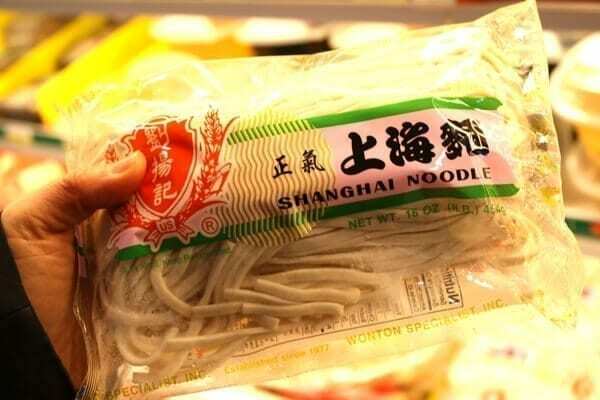 You’ll also find a refrigerated aisle with rice cakes, tofu, and fresh noodles in every Chinese grocery store. From there you get into the dry goods—aisles of hot sauces, pickled vegetables, soy sauce, vinegar, cooking wines, oil, spices, dried seaweed, dried mushroom/fungi, dried noodles, and all sorts of tantalizing Chinese junk foods like crunchy shrimp-flavored chips (don’t knock them until you’ve tried them! These days, Asian grocery stores are increasingly common, and are even frequented by a lot more non-Chinese people, who are often drawn by the cheaper produce and meat. If there’s one near you, it’s a great place to get inspired and stock up on ingredients! If you’re just getting to know Chinese cooking, here are a few items that you’ll want to pick up–a selection of the basic, bread and butter pantry items that are essential to any cook’s stockpile. That base will give you a good start, but as you get the hang of things, start exploring other ingredients. You must peruse our Chinese Ingredients Glossary that contains a wealth of information and most importantly, check out our recipes for ideas! I have walked in your shoes and seen through your eyes. That is what it felt like reading this. It was AMAZING and filled me with longing for China….a 35 min drive and I’m leaving tomorrow! Keep writing☺️? There’s a type of raw whole chicken sold at some chinese grocery stores that is unusally tough. I’ve braised the meat for hours but it still SUPER tough. I’m sure there’s a process to it and how it is used. Any idea what this type of chicken is and how it is prepared? I don’t think it is a “poor quality, etc.” chicken. It is the type of chicken and I’m sure it has a special purpose. Hi Saied, You are correct, and the chicken you are talking about is an “old chicken” or an older hen, which is why it is very tough. These chickens are used specifically sold for soup and usually the meat is not consumed. I live in Long Valley NJ And wanted to know if there’s any good Chinese groceries in the area. Not interested in going into the city, but don’t mind driving a bit. Shopping online is convenient, but nothing like walking around a grocery store. That’s perfect. I used to work in Whippany right down the road. Now in Teterboro so I’ll pass it on my way home. Hi Fenway, sorry you think so, but this post is meant to be an introduction to Chinese grocery shopping. 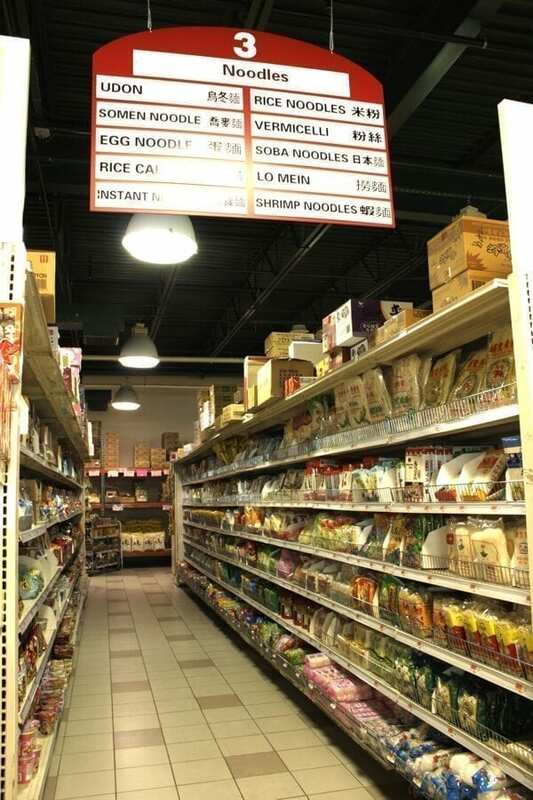 More important is using our Chinese ingredient glossary when walking around the store to help identify ingredients. 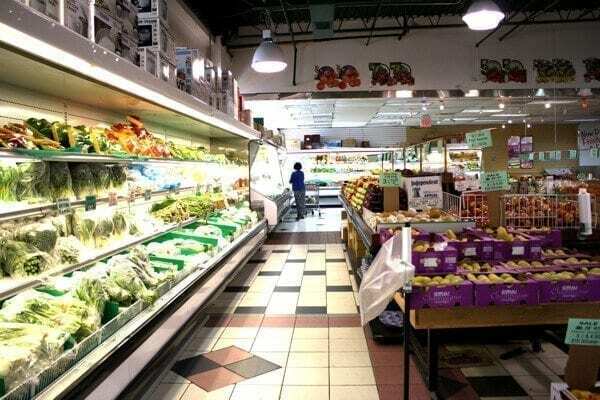 Disagree Fenway, some people have never walked into an Asian market before and it might be intimidating, so this article is actually a great intro for anyone that’s skipping their local Asian market for that reason. Calm down, don’t be such a killjoy, and say thank you or keep it to yourself. Pretty lame of you to comment like that. Easy to do so anonymously though, isn’t it? Kam Man is the Grandfather of Chinese Markets! I have been going to the one on Canal since 1978! Didn’t realize that there were other locations. That makes me happy! There was a sister store on Mott called Kam Kuo but that is long gone. I used to get prepared foods at Kam Man. Their curry squid was first rate! The layout of that market is different from modern markets, yet the idea is the same. Space is at a premium because Chinatown is very congested. Housewares are downstairs, the main floor has the other goodies. Haven’t been there in a couple of years but it always tugs at my heart when I visit. This site makes me so happy! Thank you! We have a Kan Man in NNJ in East Hanover. The best veggies, and fish in the area. Hi Hoi, this market is in East Hanover on route 10 and is called Kam Man Food. I live in Queens, 5 min from Flushing, so I have a wealth of Chinese and Korean markets. Yes, I know how fortunate I am! There are differences in companies although the layout is the same. The trouble with Chinese markets is when you find a particular item that you love, next time you go to the market, it is gone. 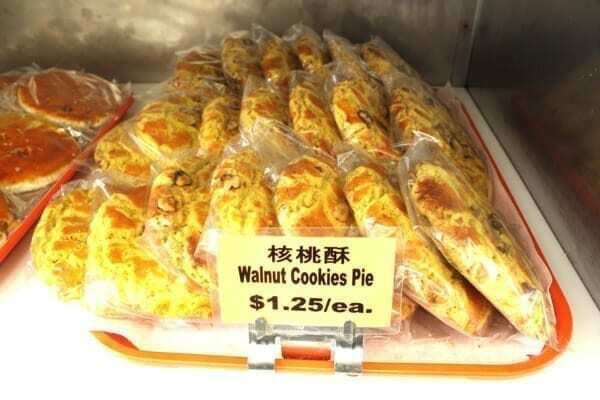 A perfect example is IMEI egg roll cookies…can’t get the caramel pudding variety! Believe it or not, I carry around a picture of the egg roll package with me when I go to the markets to show the stock staff! Sometimes, I need to go to a few markets before getting fresh rice noodles and I go early before they sell out. No problem for me but it is hard for others. Love your site! Thank you for all your recipes! Kind regards! Hi DB, thanks for your comment. You definitely are fortunate to have the wealth of grocery stores and restaurants in that area. Happy shopping, cooking and eating!